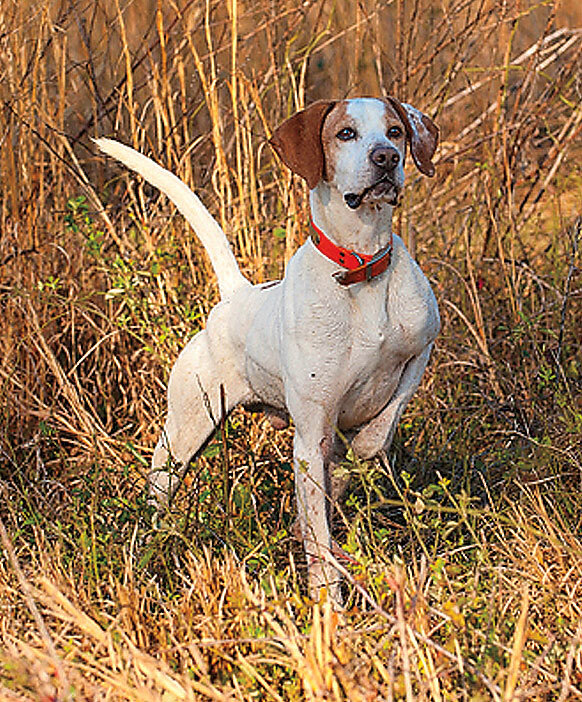 Pointers have long set the gold standard for pointing dog performance in North America. When I was asked to gun for a pointing dog trial two summers ago, I eventually wound up paired with a handsome little vizsla I'd seen staked out on the trial grounds. I wasn't looking forward to the brace. I'd watched or hunted over vizslas before, and--not to put too fine a point on it--I'd been underwhelmed. Few seemed to have much drive, and to the dog, they'd been plodders. I figured I knew what I was getting into, and I dismissed the dog out of hand. The dog's owner, a young woman from Colorado, brought her vizsla to the line, and when the judge gave her a nod, she sent it onto the course with a wave of her hand. That's when my opinion of vizslas got a radical restructuring. The dog cracked off the line as though shot from a cannon, casting into the hot August wind with style, intensity and speed. True to the breed, it wasn't a big runner--few vizslas are--but there's a world of difference between a half-assed plodder and a dog that hunts its heart out at close range, and this animal was clearly one of the latter. I was impressed and, after the brace, told the handler as much. Turns out she had another vizsla waiting in the wings, and that dog, too, was a crackerjack. I'd have been happy to spend the day hunting over either of them. In the pointing dog world, perceptions often overrule due diligence when it comes to selecting a breed. For years, my perception of vizslas colored my opinions of them. Clearly, there are high-quality, hard-charging vizslas out there. But here's the kicker: Having said that (and having hunted over yet another vizsla since then that impressed me) would I consider the breed for my own use? That is undoubtedly going to get me in trouble with somebody, so let's see if I can talk myself out of the corner I just painted myself into. It's no secret that most people love whatever breed they've chosen above all others. English pointer people love English pointers, Brittany people love Brittanys, and don't even get me started on the setter guys. This is also true of those who love the more obscure European versatile breeds, of which there are at least a couple dozen, with one twist: For some people, the more obscure the breed, the more convinced they are it's going to take the world on this side of the pond by storm. But that isn't what happens. At some point, German shorthaired pointers, German wirehaired pointers and even Brittanys were European breeds newly arrived on these shores, and it took decades of work by skilled breeders to produce the hundreds of good lines that exist in the United States today. Typically, what that involved was a gradual increase in birdiness and, in some breeds more than others, an increase in speed. Now, I know as well as anyone that vizslas have been an established American breed for years. And I've just stated that there are some good--very, very good--vizslas out there. But in my opinion, the pool of really top-notch vizslas is still small, and were I looking for a new breed, I'd probably roll the dice in a different direction. I didn't begin this story intending to knock one breed, so let's give the vizslas a rest. Nearly every one of the new (new to the United States, anyway) European breeds I've seen over the last 10 years has a similar problem: Within each breed, there are good and sometimes very good individual dogs, but the breeds as a whole--the ones I've seen, anyway--have yet to develop the kind of broad-spectrum birdiness and intensity that would put them on par with the more established American breeds. This cautionary tale applies to some American breeds as well, including Irish setters. I wrote a story for this magazine a couple of years ago about Rupert Colmore and the line of red setters he breeds, dogs that impressed me very much. But the breed as a whole, sadly, has fallen into disrepair since its heyday in the first half of the last century. Colmore and a handful of visionaries like him are slowly bringing them back, but it's been a long slog. Does that mean you should never buy a dog from an obscure American or European breed? Not at all. What it does mean is you should approach buying any breed--American, European, East Asian, Scandinavian or Texan--with your eyes open, and find out as much as you can about the available lines before plunking your money down. I've seen enough good griffons of late that I no longer consider them an unusual breed, and I've even begun recommending them to selected friends. But before buying one myself, I'd be pretty darn sure to watch the dogs in the breeder's kennel handle birds. Likewise, if I wanted a red setter, I'd be knocking on Rupert Colmore's door, but you can bet I'd leverage the down payment on a puppy into a trip in the field with that puppy's parents. Watching the parents and the other dogs in a particular kennel, more than relying solely on the generally accepted characteristics of the breed, will give you an idea of just what kind of pup you're paying for. How does all this work? Like this: When I decided I wanted an English pointer last year, I'd been around the dogs for years but never owned one. Pointers are famous for their speed and range, but I also knew, having hunted over dozens of big running dogs, some of which I owned, that extreme range for a foot-hunting schmuck like me wasn't all it was cracked up to be. Then I remembered an interview I'd done with Mark Wendling, owner of Superior Pointers in Bayfield, Wis., several years earlier. Perhaps it was his extensive knowledge of dogs, or maybe it was because we seemed to agree on so much, but whatever the reason, I'd filed his number for future reference. I shuffled through my Rolodex, found his number and gave him a call. I was looking for a dog, I told him, with drive and birdiness, a 200-yards-and-change dog on the prairies but closer ranging in the grouse woods. A happy, friendly personality was a must; retrieving ability would be nice but optional. I eventually drove to his house and spent several days over two trips watching his dogs run and getting immersed in the Wendling school of Elhew pointers, with lineage designed by the Elhew Kennels' founder Robert G. Wehle. A few days later I came home with a new puppy, Tango. With Tango just nine months old and as yet unproven on an actual hunt, I'm nonetheless very encouraged by what I'm seeing. Tango has intense drive, and so far, at least, shows no inclination to run over the nearest horizon. She's quite biddable and even loves to retrieve. Some of this may change--I suspect she'll open up a bit when she discovers real gamebirds this fall, and I haven't ruled out force-breaking her--but the preliminary indicators, as they say, are all pointing up. Had I bought a pointer without bothering to look for a line of dogs that fits my specifications, I probably would have a decent animal--there are more good lines of pointers than you can shake a stick at--but I probably would have also ended up with a dog that was a much bigger runner than I wanted. For the record, I've also checked out lines of Brittanys and English setters, and almost without exception, the dogs I've owned or trained from those kennels were good. Due diligence works. Of course, most breeds have characteristics that, in a general way, define the breed. English pointers and English setters are typically bigger-running dogs than, say, Brittanys, GSPs, wirehairs or just about any of the European versatile breeds. On the other hand, most European versatile breeds have stronger retrieving instincts than the American breeds--that's why they call them "versatile." Some, like griffons and wirehairs, can even make pretty creditable duck fetchers. So, if you're a Hun or sharptail hunter and want a big-going dog, you could do a lot worse than an English pointer or setter. If you're a deep-woods grouse hunter, you'd probably be happy with a Brittany, GSP or wirehair. But the truth is that you can get a dog from most established breeds that will work for you if you first take the time to find a good line that jibes with your particular needs and wants. That means not settling on the first litter you see advertised in the paper, and it almost always means putting off your purchase for several months to a year until you find just what you're looking for, because good breeders invariably have waiting lists. You should, in fact, put as much effort into finding a breed, and an individual puppy within that breed, as you would put into any other relationship. That is, after all, exactly what you'll be getting, for better or worse. I've had both and, believe me, better is better.